Has the India-Pakistan Cricket Rivalry Lost its Mojo? Like India’s foreign policy, an India-Pakistan cricket match was full of ups and downs. But that was back in the ’90s and to say things have changed would be an understatement. These days when India faces Pakistan, you often don’t even hear of the game until you have Cricinfo bookmarked. few years back, India playing a cricket match against Pakistan was like a festival, akin to a Salman Khan Eid release or the launch of a new season of Coke Studio. What added to the buzz was an air of unpredictability – much like the plot of a K-serial you’d never know what to expect. People came back from the dead in a daily soap, and on the field the most inconsistent players would discover form on D-Day. Pakistan’s bowling could destroy India’s batting order or Sachin could have another one of those blitzkrieg nights in Sharjah. Like India’s foreign policy, an India-Pakistan match was full of ups and downs. But that was back in the ’90s and to say things have changed would be an understatement. These days when India faces Pakistan, nine times out of ten, you don’t even hear of the game until you have Cricinfo bookmarked. What are the chances? India-Pakistan has become a more one-sided contest than North Korea’s political system. Pakistan’s batting order usually collapses like General Lee’s team in the last round of Takeshi’s Castle. India dominate with the bat like they’re playing EA Sports Cricket 2007 on PlayStation 2. Pakistan’s once renowned bowling attack looks as hapless as India’s investigating agencies trying to catch Nirav Modi, Mehul Choksi, or Vijay Mallya. 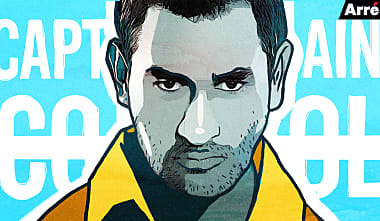 India’s bowling line-up, once quite weak, has transitioned from Rohit Mehra to Krrish. With Ravi Shastri thankfully in the dressing room and not on the field, our players barely miss catches. Our counterparts from across the border show the athletic ability of a middle-aged man suffering from a breathing disorder. The lopsided contest is hurting the rivalry, as well as cricket. Even the general excitement around the contest has dampened over the years much like a child having fever on his birthday – he will still have fun but it’s not the same anymore. Instead of the unpredictable, it is the inevitable that we wait for now. We wait for the inevitable Indian victory, for Virat Kohli to dominate with the bat, for Jasprit Bumrah to annihilate the tail, for Pakistan’s batting line-up to collapse, and for Rameez Raja to ask dumb questions in the post-match interviews. India-Pakistan games have become more predictable than the weather forecast in Mumbai during the monsoon. The only time the matches get exciting, is when the expected doesn’t happen, when Pakistan is able to punch above weight, like in the Champions Trophy 2017 final where they destroyed India. A game that provided rich material for fans to engage in banter. But we need more of that. Unfortunately, Pakistan have become underdogs, and it’s no fun beating a team that is already down in the dumps. What’s the point of an India-Pakistan game if at the end of the 100 overs you haven’t bitten off all your nails? Today, as Pakistan struggles to catch up, Bangladesh has upped its ante. Over the last decade, and especially since the IPL, India has become a cricketing powerhouse. If cricket is a board exam, Indian cricketers are Sharma ji ka ladka. Meanwhile, Pakistan has been on the low. While there was once a sense of joy and achievement about beating Pakistan, saying “Final har jao magar Pakistan se jeeto” is not thrilling anymore. The 2007 T20 World Cup Final was probably the last game that had all the elements of what an Indo-Pak contest should be about – hype, thrill, pressure, and constant change of momentum. The epic photo finish not only gave us one of the most memorable games between the two teams, but also served as a great advertisement for the rivalry as well as the game of cricket. But that was 11 years ago. Since 2010, India and Pakistan have played each other 13 times in ODIs and it has been a one-sided contest with India winning almost twice as many games. Today, as Pakistan struggles to catch up, Bangladesh has upped its ante. Bangladeshi fans play rough on social media with photoshopped memes and over the last few years, their players have stretched the Indian team more than they would be comfortable with. If fierce competition coupled with banter defines rivalries, Bangladesh are bringing it to India. While fans might still tune in and have a poke at each other, for all practical purposes, the Indo-Pak rivalry on the field is dead and India vs Bangladesh could very well be the new India vs Pakistan. But what’s cricket without its great rivalries? For Indo-Pak cricket to get its charm back, we need more Venkatesh Prasad-Aamir Sohail clashes, Javed Miandad-Chetan Sharma last-ball finishes and Misbah ul Haq-Joginder Sharma battles. Come on, Pakistan.